Cheniers are relict wave-built coastal plain landforms that occur in sets inland from the shoreline where they originally formed along an active beach as littoral ridges. They are sheltered from daily wave and tidal processes and generally consist of sand, sandy shell, and occasionally sandy gravel. Chenier ridge sequences may develop on prograding deltas or non-deltaic coastal plains. Cheniers form subparallel sets of elongated, narrow ridges (typically up to 3 m high and 40–400 m wide), usually rising slightly above the highest high-tide level. Wave action and storm overwash build the original littoral ridges. The term chenier (Russell and Howe 1935) originated in the French native word (chêne) for the majestic evergreen “live oak” tree (Quercus virginiana) that lines chenier ridges of southwest Louisiana. Cheniers differ from beach ridge sets (q.v.) by the presence of intervening, parallel, low, and level surfaces that represent predominant portion of chenier plains. Cheniers are separated by wide intertidal or shallow subtidal mudflats, much wider than the ridges, covered by wetland vegetation. Low-lying interior inter-ridge flats may occasionally be submerged by high tides or river floodwaters to form brackish or fresh water wetlands. Intervening areas may even be barren of vegetation or covered at least in part by grasses, salt marsh, freshwater swamp, or mangroves. Misidentification can happen when inter-ridge swales (lows) in a (non-chenier) ridge plain are filled by fine-grained peaty alluvial or delta deposits, covered by recent wetland vegetation. The term chenier plain includes both the inter-ridge flats and the chenier ridges, where at least two successively formed ridges are present (Otvos and Price 1979). The latter caveat, unfortunately, has occasionally been disregarded. The term was misapplied to beaches capped by shell-concentrate berm ridges at high-tide level where the beach foreshore faces low intertidal mudflats along the ocean shore (e.g., Neal et al. 2002; Weill et al. 2012). Equally inappropriately, a “chenier” designation was also applied in at least one highly dynamic setting with significant ebb and flood tidal action. Prograding arms of constantly changing, low intertidal sand bar ridges in this small estuary have been migrating over and surrounded small areas of intertidal-subtidal mud flats (Morales et al. 2014). Successively formed cheniers usually occur in a subparallel seaward sequence as the coastline progrades. Even where there is a substantial shell content, the slopes bordering cheniers tend to be gentle (Byrne et al. 1959). In the fine sandy, shell-free Suriname cheniers, the slope is nearly level (Augustinus et al. 1989). Two of the world’s largest chenier plains are found along the coasts of Louisiana and Guiana (Fig. 1), but smaller chenier plains occur on many coastal plains, often behind embayments. Chenier coasts are associated with a broad spectrum of tidal amplitudes that range from microtidal (e.g., SW Louisiana) and mesotidal to macrotidal (e.g., Van Diemen Gulf in northern Australia, Gulf of California). Most cheniers are of mid- to late-Holocene age, but cheniers of Pleistocene age occur in the Colorado Delta region of the Gulf of California (Meldahl 1993). Due to constructive overwash from storm surges, the chenier crests may slightly exceed highest high-tide level. As traced laterally along given chenier ridge sets in Louisiana (Fig. 2), locally variable sand supply and wave conditions resulted in highly variable ridge crest elevations. Given an adequate coastal sand supply and sufficiently strong onshore winds, cheniers may be capped by small foredunes, or at least veneered by eolian sand (e.g., Suriname, Augustinus et al. 1989; SW Louisiana, Byrne et al. 1959). Chenier ridge heights, including ridges, even if their elevation not dune-enhanced, do not necessarily mark former sea levels. 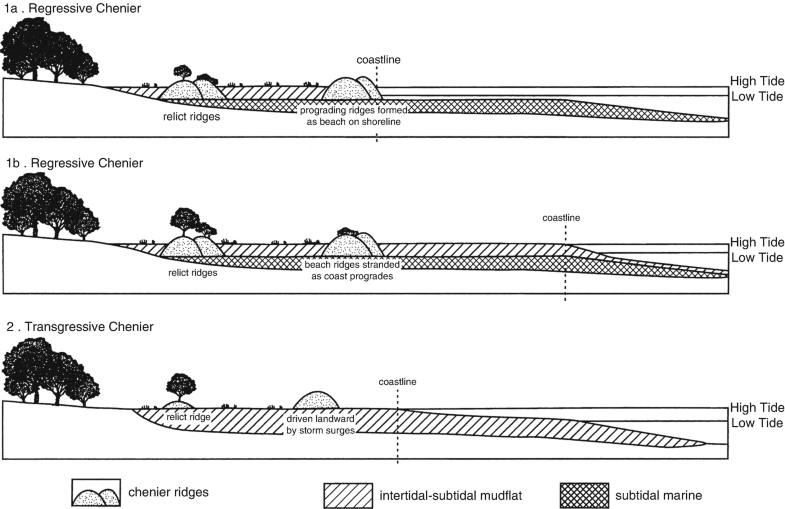 In small bays mudflat progradation, alternating with sand and shell accumulation and chenier incorporation into developing chenier ridges occur simultaneously (Woodroffe and Grime 1999). Side-by-side formation of a chenier passing laterally into a sandy beach ridge was described from the northeastern coast of Australia (Chappell and Grindrod 1984). 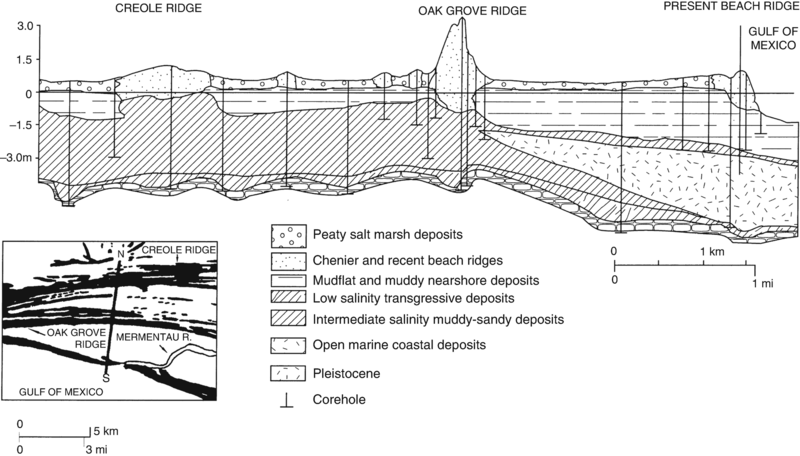 Regressive cheniers that formed successively along the shore of a prograding delta or coastal plains overlie shallow nearshore marine and intertidal deposits (Fig. 3). On tropical shores, these cheniers may extend 1 m or more below the surrounding high-tidal mudflats, down to the buried top of mangrove deposits (Cook and Polach 1973). Except beneath landward-inclined slopes, formed by overwash, seaward-dipping low angle (<15) lamination and cross-stratification are typical in most of the cheniers. Sandy shell ridges, driven landward over intertidal flats and through mangrove thickets, are transported by intermittent wave swash during high tides. Eventually, they become stranded and stabilized as transgressive chenier ridges (Fig. 3) (Thomson 1968; Jennings and Coventry 1973; Woodroffe et al. 1983; Chappell and Grindrod 1984; Woodroffe and Grime 1999). 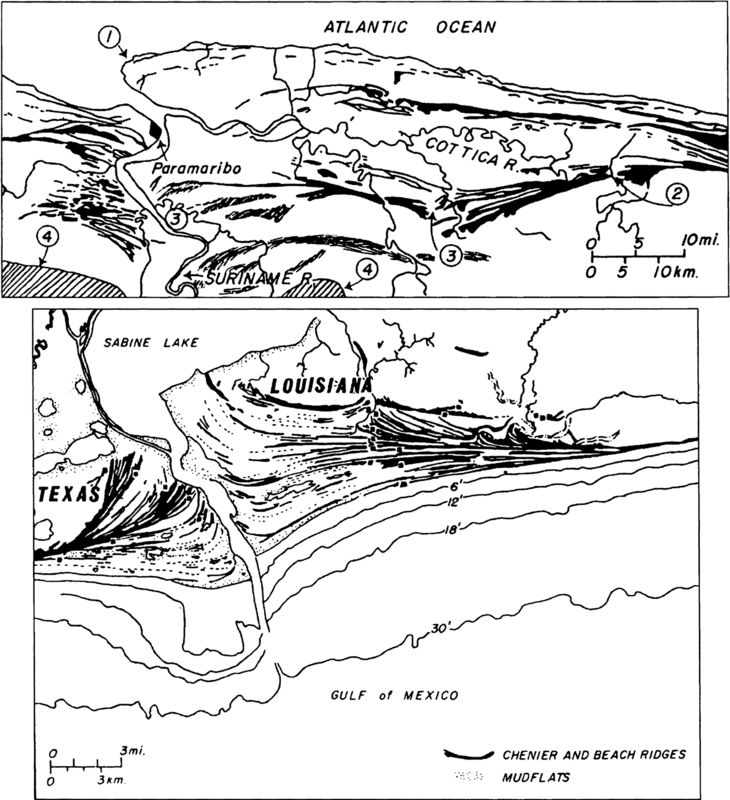 In a detailed morphological discussion of Louisiana chenier ridges, McBride et al. (2007) identified originally longshore-prograded regressive ridges and their recurved spit-ends as a separate category. Leading to speculation of higher than present late Holocene marine highstand due to aggradation by tropical storm overwash, chenier berms in Louisiana and elsewhere may exceed the highest high-tide level by 1–2 m.
Following the original definition of cheniers as transgressive features (Russell and Howe 1935, pp. 27–34), several authors defined “true” chenier ridges as landward-driven landforms (Otvos 2000). However, stratigraphic and morphological data indicate that most Louisiana cheniers are not transgressive. Transgressive cheniers are generally emplaced during storm surges, when large waves on a temporarily raised sea level sweep beach sediment inland. With their shallow ridge bases, transgressive chenier ridges display washover-induced, landward-inclined stratification. They overlie intertidal, low-supertidal mud/marsh surfaces at very shallow depths. Powerful tropical storms often erode and even flatten landward migrating ridges. Even if lesser events effectively translated them landward before and after the storm, the 1974 hurricane surprisingly had no appreciable impact on the landward migration of sand and shell ridges in Shoal Bay, Australia (Woodroffe and Grime 1999). Several articles shed light on details of evolution and regional correlations of cheniers in Australia (Horne et al. 2014) and New Zealand (Daugherty and Dickson 2012; Horne et al. 2015). Chenier plains in northern and southern Australia developed mostly between 2400 and 1300 yr BP and probably during the last 1000 years. Alternating chenier ridge and inter-ridge-mudflat development, in Louisiana, has long been associated with periodic avulsion-related delta lobe switching. Distal positions of river discharge generally result in (mudflat) shore erosion and shell and sand concentration. This leads to formation of active (“pre-chenier”) littoral ridges along the shoreline. Large-scale mud discharge from nearby (proximal) active lobes, on the other hand, favors mudflat progradation. Roberts and Huh (1995) and Anthony et al. (2011) provided valuable new insights regarding the evolution of Amazon-discharge-related Guiana mud belts, respectively, recently developing Atchafalaya mudflats along Louisiana’s previously severely receded eastern chenier plain sector. Longshore transport from the Atchafalaya delta and onshore stranding of suspended fluid mud during winter cold front water level set-down resulted in extensive mudflat formation. Momentarily dry weather and other climate conditions favor the process. In the course of desiccation and compaction, low-tidal flats prograded along a 20 km stretch of the low-microtidal chenier coast. Progradation averaged 50 m/year in the most actively accreting sectors. Cheniers plains, including regressive and transgressive relict littoral ridge sets and intervening, often wetland-covered intertidal mudflats reflect important coastal episodes of stream discharge and shore erosion- and progradation-related changes. The occasionally still misused term “chenier plain” includes both the inter-ridge flats and the chenier ridges, where at least two successively formed ridges are present. Chenier ridges are isolated from the active beaches that front the chenier plains; they are insulated from daily littoral processes of wave and tidal action. Ridges are composed of sand, seashell, and occasionally gravel. New findings confirm the role of weather conditions in the sediment sources, desiccation, and consolidation of inter-ridge mud flats. In the large Louisiana chenier plain, delta lobe switching due to trunk stream avulsion played a role in changing sites of mud flat deposition. Two late Holocene episodes of chenier plain development have been identified in Australia’s numerous small chenier plains. (q.v.,Beach ridges; Gulf shorelines: Last Eustatic Cycle).